Finding a male ancestor’s United States passport is easier than finding one for your female ancestor. The reason has to do with social mores and the way that passports were issued. In some cases, your female ancestor’s name wasn’t actually listed on the passport she traveled with! The United States first issued passports during the American Revolution. Those passports were issued to a small group who were part of Benjamin Franklin’s mission to France. Later, the Foreign Affairs Department was put in charge of issuing passports to all American citizens who were going abroad. In 1879, the Foreign Affairs Department became the State Department. Passports became standardized around that time. 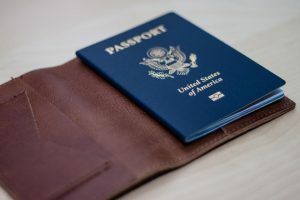 A man would be listed on the standardized version of the United States passport by his first and last name. An unmarried woman, who was traveling by herself, would also have a passport that showed her first name and last name. Married women, however, were often listed as “wife” on their husband’s passport – as in “Mr. John Doe and wife”. Names were listed this way because of social mores. It was deemed perfectly acceptable for a man to travel wherever he wanted to with or without his wife. An unmarried man could do as he liked. An unmarried woman, who did not belong to any man, could do the same. However, a man who was traveling with a woman faced a potential social dilemma. It was not acceptable for a man to be traveling with a woman whom he wasn’t married to. This problem was solved by listing the man’s spouse as “wife” on his passport. (Wives did not receive their own passports). One way to find your female ancestor’s passport is to figure out what year she got married. Next, see if you can pinpoint the year she traveled. If she was unmarried at that time, you should search for her first name and “maiden name” surname. If she was married, you will have better luck if you search for her husband’s passport. A married woman could apply for an independent passport if she planned to travel separately from her husband. It seems that this type of passport wasn’t issued before World War I. Some countries did not require travelers to have passports at that time. This enabled some married women to travel independently without having to get a United States Passport. Back then, a passport was considered to be a written request for protection and assistance from the government (in case something went wrong). Men who were traveling alone, and unmarried women who were traveling alone, needed that protection from the government – and thus, their own passport. It was assumed that a married woman would be protected by her husband.